Autumn (also known as Fall in North American English) is one of the four temperate seasons. Autumn marks the transition from summer into winter, usually in late March (southern hemisphere) or late September (northern hemisphere) when the arrival of night becomes noticeably earlier. The word autumn comes from the Old French word autompne (automne in modern French), and was later normalized to the original Latin word autumnus. There are rare examples of its use as early as the 12th century, but it became common by the 16th century. Before the 16th century, harvest was the term usually used to refer to the season. However, as more people gradually moved from working the land to living in towns the word harvest lost its reference to the time of year and came to refer only to the actual activity of reaping, and autumn, began to replace it as a reference to the season. The alternative word fall is now mostly a North American English word for the season. It traces its origins to old Germanic languages. The exact derivation is unclear, the Old English fiæll or feallan and the Old Norse fall all being possible candidates. However, these words all have the meaning “to fall from a height” and are clearly derived either from a common root or from each other. The term came to denote the season in the 16th century, a contraction of Middle English expressions like “fall of the leaf” and “fall of the year”. Association with the transition from warm to cold weather, and its related status as the season of the primary harvest, has dominated its themes and popular images. In Western cultures, personifications of autumn are usually pretty, well-fed females adorned with fruits, vegetables and grains and wheat that ripen at this time. Most ancient cultures featured autumnal celebrations of the harvest, often they are one of the most important on their calendars. Still extant echoes of these celebrations are found in the mid-autumn Thanksgiving holiday of the United States, and the Jewish Sukkot holiday with its roots as a full moon harvest festival of “tabernacles”. There are also the many North American Indian festivals tied to harvest of autumnally ripe foods gathered in the wild, the Chinese Mid-Autumn or Moon festival, and many others. In the UK it is during the autumn that harvest festivals take place. The predominant mood of these autumnal celebrations is a gladness for the fruits of the earth mixed with a certain melancholy linked to the imminent arrival of harsh weather. This view is presented in John Keats’ poem To Autumn where he describes the season as a time of bounteous fecundity, a time of ‘mellow fruitfulness‘. The beginning of autumn is a joy for me, especially in a culinary sense. I love the fact that it opens up the season of slow cooked comforting meals such as stews and pies, and, even more so that my preserving pan gets back into some serious action. With an overflowing fruit bowl of discovery apples and some lovely plums waiting to be eaten I just knew I had to get the big preserving pan out. My first autumnal preserve has been an apple and plum jelly which I have named Autumn Blush. It gained its name partly because we are not fully into autumn yet, we have just had a wee blush of it and partly because the jelly is a gorgeous pale rose colour, which reminds me of the pale red blush hue of the apples. I flavoured the apple & plum jelly with a touch of juniper; although not an obvious choice it worked really well. The juniper added a rich, pungent, resinous note to the jelly; which had a tart background due to the apples and a rich sweetness from the plums. All in all it is very well rounded, I would say it feels like you are ‘eating the apple tree’ but maybe that doesn’t sound too great. Making a jelly is not a complicated process but it is rather slow, the fruit has to be cooked and then strained overnight to allow the juices to drip freely before getting boiled with sugar the following day until setting point is reached and the jelly can be jarred up and stored. 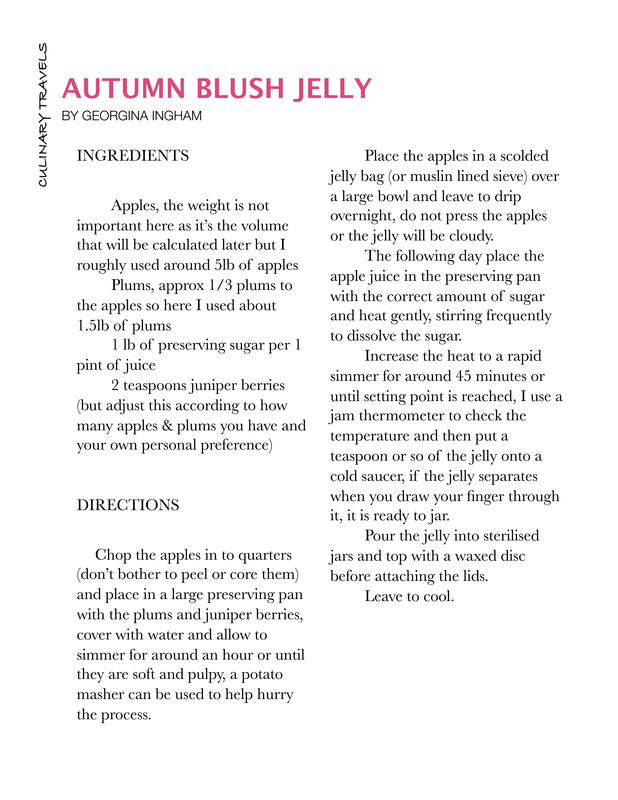 Providing the jelly is put into sterilised jars and sealed correctly it will last for at least six months, after that time I find they start to darken and go a little runny – still edible but not as good as when eaten within the six months. The colour of the jelly will vary according to which apples you use, I was lucky enough to have pink tinged discovery apples which enhanced the colour but whatever you use it will still taste great. I like to spread the jelly on toast or cakes. I often add some to fruit tarts, cakes and pies. It can be served with cooked meats but I don’t really care for it like that. You can read about how to sterilise your jars here. I am entering this jam to Virtual Jam Swap hosted by Aimee of Under The High Chair. Aimee’s blog is absolutely lovely and well worth a visit.